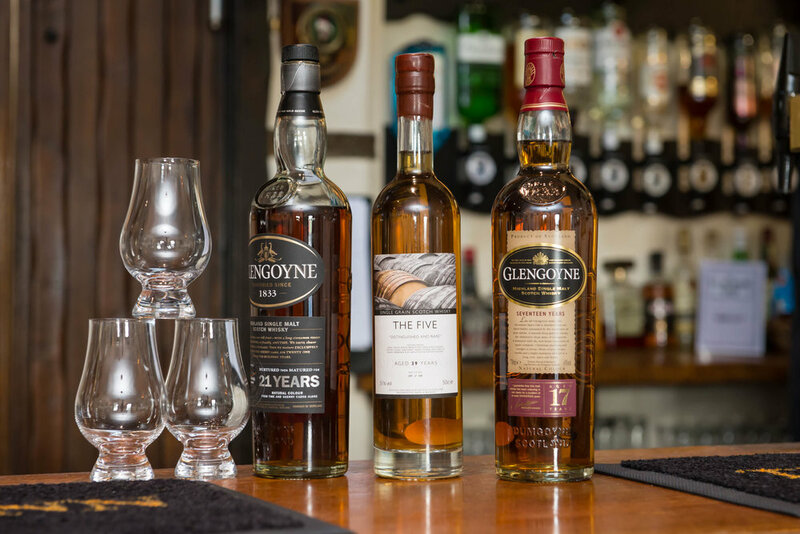 We are incredibly proud of our extensive whisky range. The collection has been hand selected by us from some of the finest distilleries across Scotland. Our closest distilleries Auchentoshan, Deanston and Glengoyne are featured. We’d be delighted to answer and questions that you may have, or recommend a whisky. Twelve years maturing in American white oak ex-bourbon cakes, then a three year finish in three different sherry woods. A robust, yet elegant spirit. Awarded 95 points in Jim Murray’s Whisky Bible. Clean and crisp with heather notes. Fresh citrus and Seville orange combine with toasty vanilla oak characters. Charred fruit and coffee with smooth, rounded citrus. Light, fruity, green apples and citrusy, from our local distiller. Lemony, toffee and vanilla finishing with shortbread notes. Textual and rich, with notes of toffee popcorn, salted butter and ints of ground walnuts. Spicy vanilla, apple pie, marmalade and winter spices. Red apples, sultanas, hazelnuts, dried fruits and sherry cask flavours. Mandarin, lemon, apple, pear and peach. Hints of toasted granary bread with cereal notes, barley sweetness. Gentle estery sweetness. The palate is thick and full. The smoke wafts with notes of seaweed. The oak is quite rich with malty fruit and dry oak. The casks have taken time to absorb the Northern Scottish sea breeze and as a result Old Pulteney is often referred to as ‘The Manzanilla of the North’. Sweet and spicy with a long, light smoky finnish. Light, delicate and sweet with hints of pepper and pine. Elegant, fresh and complex with lasting character. Soft honey and orchard fruit flavours from this family owned distillery. Caribbean rum casks impart flavours of apples, mangoes and a hint of orange. A strong malty taste with hints of sweet wood, smoke and sandalwood. A world away from the dedicated Speyside style, this is full of fruit, fire and flavour. Aged in Oloroso sherry casks, providing rich, nutty and sweet characters. Superb - complex and smooth. A perfect balance of age and the lightness of Speyside. Richer and fuller than the 21yo but still maintains the balance of power and after-dinning sipping softness. Oily and smooth with floral touches, fruit and a hint of green leafiness. The classic Speysider, light, soft and fruity. Apple, raisins and honey sweetness with a nice oaky finish. Smooth, mellow, malty and nutty. Easy-sipping, light and floral with tropical fruits character. Aged sole in sherry oak which provides delicious dried fruit flavours. Chocolate covered caramel and barley sugar with smoky leather, raisins and linseed oil. The unpeated Islay, All the barley for this whisky comes from the island. Delicate, fruity and coastal flavours make for a perfect shellfish accompaniment. The unpeated Islay malt. Light, fresh and plenty of maritime notes with a sweet touch. Honeyed nuts, toffee and a salty tang, following through to a spice and sea spray finish. Soft cooked fruits with strong, peaty aromas on the nose. Mixed fruits show on the palate, with hints of vanilla finishing with lots of sweet peat. Tea and pipe tobacco, fish boxes and kippers, but is always sweet. The palate shows more creosote, with hints of kelp and a little touch of iodine. Complex, plenty of peat. Huge smoke, medicinal seaweed and a hint of sweetness. Delightfully coastal with hints of oily barley, vanilla and smoke. Full, earthy and lingering with saddle leather, raisins and coal tar. Spicy grapefruit, maltness, more spice and a treacly sweet texture. A floral, spicy finish. Dry, earthy and complex with a fruity bite. A great all-rounder with a warming, silky mouthfeel and a swathe of heather honey. Crushed almonds, pineapple and fresh roasted coffee, borne of a mix of American white oak and sherry casks. Sip it slowly and you’ll also pick up citrus fruits and dark toffee. Creamy and sweet with notes of tropical fruit and heather. Peat and iodine with notes of brine, kelp and a hint of sherry. Rich dried-fruit sweetness with clouds of smoke and strong barley-malt flavours. The warming, peppery finish is huge and long with an appetising sweetness. A single malt from Girva. Peaty kick payed with a beautiful sweetness. A meaty character too, crispy rashers with a hint of maple syrup. Blackcurrant, brown sugar, orange, plum and raisins with a lick of fruit syrup. The very first widely available blended Lowland malt - a combination of East and West coast Lowlanders. Delicately light with notes of fresh grain, sugary barley, toasted nuts and stewed fruits. Initially fruity with citrus notes and orange peel, after this: vanilla, butterscotch, honeycomb and digestive biscuits. A perfect balance of rich spicy fruits, overlaid with the characteristic sea spray and vanilla oak finish for which Glen Scotia is famous for. Good, clean and traditional, triple-distilled and unpeated. The peat is present and quite pungent with an earthen routines. Notes of exotic fruit and a hint of fresh coastal salinity. A bewildering array of flavours: dark chocolate, figs, marzipan, brazil notes and vanilla. Candied citrus peels, icing sugar, vanilla and a hint of oak spice. An exceedingly rare independent bottling of a single cask 39 year old Invergordon. Exotic tropical fruit sweetness overlays vanilla and coconut bourbon cask sweetness, with a graceful and distinguished finish. Very special indeed.